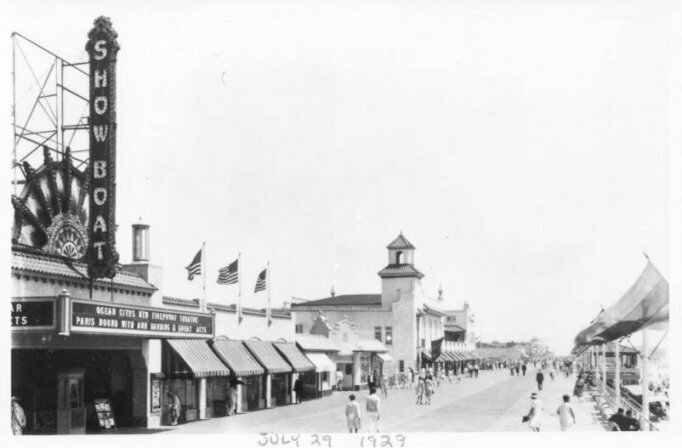 Soon after the 1927 fire, the Showboat Theatre was built at 12th Street on the Boardwalk. Advertised as Ocean City's only Fireproof Theatre, it was constructed out of continuous concrete (using beach sand, I'm told). The Showboat was a large theatre with 2,000 wooden seats and a full stage. The stage had very tall fly space for raising scenery, footlights, a dimmer panel, and rows of sandbags and ropes. The projection room included a powerful carbon arc spotlight that still worked when I was a projectionist there in 1978. Legend has it that lots of vaudeville acts performed there in the 30's including the Little Rascals, although I've never confirmed this. 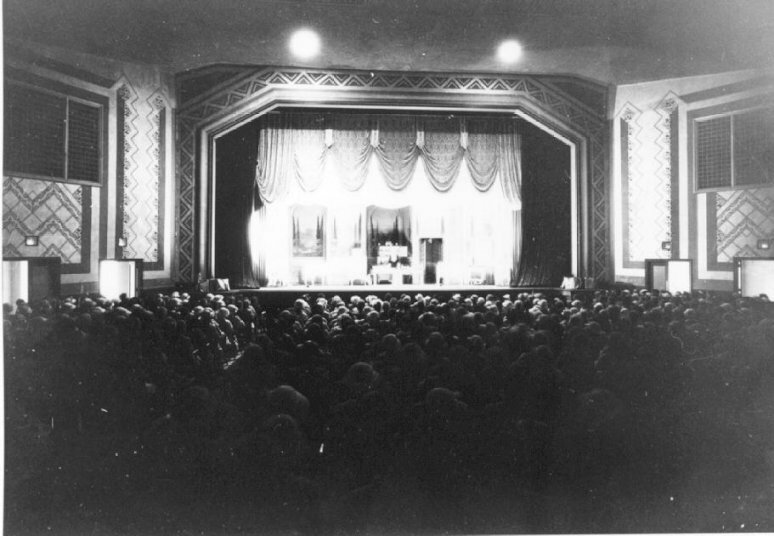 Originally the theatre was operated by the Wildwood theatre chain and some time later was purchased by the Frank Theatres in Atlantic County. The local Ocean City theatre chain (Shriver's) leased the theatre for many years despite the deteriorating condition of the building. When I worked there in the late 1970's, the building was already in bad shape. The first 100 seats were permanently roped off due to standing pools of water. Wall treatments had fallen off of large sections of the wall due to water damage from the open holes in the roof. The theatre never had air conditioning or heat like the others, but had large fans in the roof. Each year we would dig out dead pigeons from the fan rooms and marquee before opening for the summer season. But the building was interesting to explore. The electric room had large exposed knife switches for the neon, the fans, and the projection booth. A narrow spiral stairway let to the projection booth and film vault. In 1977, the projection room included two Simplex E-7 heads, transferred from the STRAND. The original heads were Simplex Super's. Sometime during it's life the name was changed to the SURF after the SHOWBOAT sign blew down in a storm. I'm told it was cheaper to spell SURF and so the name changed. Around 1979 the Shriver company ceased operation at the Surf. Another operator tried movies for a year but did not succeed. Today the building is an enclosed mall for T-Shirts and souvenirs.